Extra might be a stretch, but it’s a great little Kirby game nonetheless. Just when you think there is nothing else Nintendo could throw at the Nintendo 3DS, they bring back a Wii classic. Revealed during a Nintendo Direct in September 2018, Kirby’s Epic Yarn is to make a comeback in 2019. 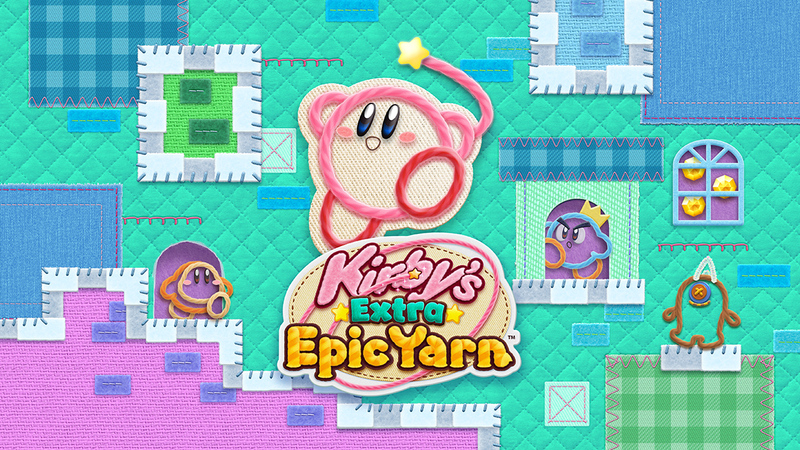 Only instead of being a spiritual successor like Yoshi’s Woolly World for the Nintendo Wii U, or a full-fledged sequel, Kirby’s Extra Epic Yarn is a feature enhanced port that adds new ways to at the expense of removing some of the features that made the 2010 release as good as it was. You see, while Kirby’s Extra Epic Yarn adds amiibo support, new ravel abilities that mimic Kirby’s copy abilities and two new game modes, co-op has been removed entirely. Whereas before on Wii and Wii U, where a second player could play as Prince Fluff and the two of you could work together as you venture through Patch Land, this is no longer the case. Just because the fun can’t be shared though, it doesn’t mean Kirby’s Extra Epic Yarn is not a game that can’t be enjoyed as a singular experience because in actual fact, it works rather well. In terms of the performance, Kirby’s Extra Epic Yarn runs rather well on the Nintendo 3DS and its creative yarn visual design, is still a sight to behold, even though it is distinctively darker when compared to the original release. Unlike the 2010 release however, Kirby’s Extra Epic Yarn doesn’t run at 480p as it instead runs at 240p. It’s most likely it is this compression that is the reason why Kirby’s Extra Epic Yarn is a 3DS game as opposed to Switch, due to the fact that the game would have required a visual upgrade to justify a Switch release, compared to undertaking a slight graphical demake. Despite what has been changed, there are a few things that remain and one of them is the soundtrack that is just positively lovely throughout and compliment the cutesy yarn art style. As for something else that’s the same, is the story. It all begins in Dream Land, with Kirby coming across a tomato that resembles his beloved Maxim Tomato. In reality, it was a yarn tomato called a metamato. Kirby couldn’t help himself but eat it, only it wasn’t his to eat. Having witnessed his metamato be eaten, a sorcerer called Yin-Yarn, transform Kibry into Yarn Kirby and whisks him away to Patch Land. It is in this new world where Kirby encounters a Cyclod chasing Prince Fluff. Being the hero that Kirby is, Kirby attempts to inhale the Cyclod, but now made of yarn, it’s to no avail. Instead, he turns into a car and drives off with Prince Fluff in tow and ends up in Quilty Square. It is from that point on where Kirby’s journey through Patch Land can begin, starting with Patch Castle. In terms of gameplay, to compare Kirby’s Extra Epic Yarn to a modern title, it is similar to Kirby Star Allies and Yoshi’s Crafted World. As a side-scrolling platformer, players must make their way from one side of the level, to the other side, whilst overcoming a series of enemies. Although the way, there are tons of beads that can be picked up, which act as the game’s currency. There are also treasures in the form of collectable furniture items and soundtracks, but to get them all, is to hunt far and wide in a bid to seek them out. No stone can be unturned. No secret route can be left unexplored and no treasure chest can be left unwrapped. Now, depending on the number of beads you collect along your way, once you complete the level, Kirby can earn either a Bronze, Silver or Good medal, but you will need to be careful. You see, while Kirby can not die on the normal difficulty, getting hit or falling down the wrong pitfalls, will cause Kirby to lose some of the beads you collect and since they can be used to help build new floors for an apartment block and buy new fabrics and items from the shops present in Quilty Square, every bead counts. Across the game’s multiple lands, each one except for Quilty Square has seven levels, but only beating five is required to move on to the next land, since the fifth level of the lands mentioned, is a boss battle. Should you sustain constant hits, you will lose a lot of beads during the fights and simply obtain a piece of magic yarn when the fight it over. However, if you are able to hold your own, dodge the boss’ attacks and collect the right amount of beads, you will acquire the needed patch to unlock the sixth stage in a given land. Still, it is worth mentioning that whilst exploring each stage and undergoing segments where Kirby must transform into an array of vehicles, which includes a submarine, players will no longer have to rely on Kirby’s whip attack. Thanks to the addition of the ravel abilities, which work in a similar fashion to Kirby’s copy abilities, across the game’s levels, players can encounter hats, which when worn, grant Kirby new skills such as a very useful extra jump, or a wire power-up that arms Kirby with a sword-like weapon. There are six ravel abilities in total and while they do make the game come across as being even easier than when it was on the Wii, for the players who wish to make the game harder, they can always try out Devilish Mode. Essentially, it is a game mode that allows you to replay any level you want on a harder setting, whilst a devil pursues you and Kirby has a health meter consisting of five cells, which if depleted before the player makes it to the end of the level, they will need to try again from the start. In the event you are able survive, this harder setting allows players to earn new furniture, which they can then use to spruce up Kirby’s flat. For a touch of Animal Crossing in a Kirby game, I must admit it is enjoyable being able to do Kirby’s place up however I choose, before sharing it via StreetPass. Given this stage in the 3DS’ life cycle, I highly doubt anyone would ever see it, but it’s a nice option nonetheless and adds a little more gameplay to a game I had previously ignored. Also, provided you have a bed or a chair placed, pressing down will still cause Kirby to jump into bed or onto a chair, when near them and you can still turn the light off. Also available in Quilty Square, is the apartment block that Kirby can donate funds to, to build, which comes with additional apartments for NPCs to move into, giving way to mini-games that will have Kirby seek out his neighbours, do some training, or just collect a specific number of beads. On top of the mini-game fun, players can also access Patch Plaza to check on their in-game progress, to see just how well they are doing and it would be remiss of me if I didn’t bring up the amiibo support. Granted the game only supports the Kirby series of amiibo, when an amiibo is scanned in, it will give Kirby a yarn hat representing the amiibo that was used, and given a ravel ability that matches the character the best. Even after all of the above though, I have yet to go on about Dedede Gogogo and Slash and Bead. Available from the get-go in Kirby’s Extra Epic Yarn, both are new modes exclusive to this release, in which allows the player to play as the likes of Dedede and Meta Knight. In the likes of Dedede Gogogo, players need only to get Dedede from the beginning to the end of the level, whilst collecting as many beads as they can. They can slide and they can attack, but the mode is short lived and limited to four stages, three of which are unlocked as you play through the story mode with Kirby. On the plus side, for every rank you score, there more fuse beads you can use to create bizarre fused bead creations and the same can be said for Slash and Bead. While Meta Knight must fly and fight his way across his four stages, he too must gather as many beads as he can in the hopes of obtaining an S rank and creating every item available. As enjoyable as the two modes are however, they are at the end of the day, filler content intended to help put the “Extra” in Kirby’s Extra Epic Yarn, but ultimately, they feel a little too shallow for my tastes and I would have liked a couple more stages for each one, just to bulk them up. They’re not the worst thing the game does however, because not only is this a 3DS game that doesn’t take advantage of stereoscopic 3D, but the game doesn’t feel like a made for 3DS game, despite the inclusion of touch-screen controls and despite how much I like them, the ravel abilities do feel a little out of place. It’s a good afterthought and a good attempt at pulling them off, but they don’t always go hand in hand with the games level design. In spite of its age, Kirby’s Extra Epic Yarn is still the engaging game it always was, but now its overall gaming experience is different from that which those who have played it before, would remember. Sure, the key aspects are still the same, but with a distinct art style that still keep it feeling fresh and some great platforming design throughout, at the end of the day, Kirby’s Extra Epic Yarn is a game that is hard to say “no” to. I wouldn’t go as far as saying it is the best way to play the game, but there is enough to this handheld adventure that does warrant a second playthrough if you’re still open to the idea of playing games on your Nintendo 3DS.